When thinking of the perfect location for a wedding, does anything conjure up romance more than a vineyard? Vineyards are picturesque. There is a romanticism. The views are ideal for photographs. And vineyards can fit all wedding styles, from intimate to large, informal to formal. While there are many wineries with event space, not every winery is able to host a California winery wedding. Here are four wineries from Sonoma to Paso Robles offering unique venues for wineries. Rolling hills and valleys, groves of majestic redwood trees and world class wines, Sonoma County stretches from the Pacific Coast in the west to the Mayacamas Mountains in the east. There are more than 400 wineries within the 17 appellations. One of these appellations is the Sonoma Valley AVA which centers around the southern portion of Sonoma County and includes the towns of Santa Rosa and Kenwood where two of the California winery wedding venues are located. Paradise Ridge Winery is a 156-acre Russian River Valley Estate owned by the Byck family since 1978. Dr. Byck proposed to his Dutch wife in a sculpture garden in Holland. They later settled in Sonoma with their five children and bought the property, naming it Paradise Ridge, because they enjoyed nature and felt that they land was paradise. On the property, they have 20-acres planted to grapes, a sculpture garden and a number of places to host a wedding. There is a European-style courtyard, verandas, terraces and a dining room, all with unbeatable views. A few highlights are the leaf-shaped deck, made with ipe, a Brazilian hardwood, which is ideal for a reception, and the Poetry Terrace is a lovely place for an outdoor ceremony. There is even a pizza oven on-site, should you want pizza. Paradise Ridge Winery can accommodate weddings ranging from 120 to 200 people and the party can go past 10pm (a rare thing for a California winery wedding)! Deerfield Ranch Winery, owned by Robert and PJ Rex, sits on 46-acres, which includes marshland, wetlands, forest and six acres planted to syrah. Located just off the highway, the quiet and peaceful property includes a 23,000-square-foot cave. For a wedding with 80 to 120 people, Deerfield Ranch Winery offers both indoor and outdoor options. The outdoor crush pad offers a panoramic view of Kenwood Marsh, surrounding hills, and the vineyards. The grassy area by the pond is adjacent to the vineyard and a lovely location for the ceremony. The rustic cave, with an elegant Grand Room, can be perfect for a reception, with long tables set among the wine barrels, or food and wine stations can be set throughout for walk-around reception. The cave does not have air conditioning but will be a consistently cool temperature, no matter the season. 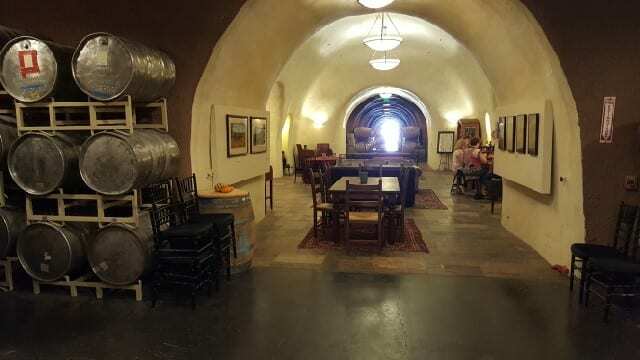 A wedding in a wine cave is a unique experience that is ideal for a hot summer day or a rainy day. And for something fun, Deerfield Ranch Winery can customize wine labels or a barrel for the wedding party. This is a fun add on to a California winery wedding. Located along the Pacific Coast, Monterey County is home to Big Sur, Carmel and Pebble Beach, three scenic areas that scream romance. Carmel-by-the-Sea is a small beach city on the Monterey Peninsula, home to boutique hotels and stores, restaurants, wine tasting rooms and the beach. A five-mile drive inland will take you to vineyards where you will find a perfect California winery wedding destination. Folktale Winery is a French country-style winery located in the rolling hills of Carmel Valley. Sitting on 17-acres, the winery can accommodate receptions for large parties, even up to 1000. And the choices for where to host the wedding are endless. It can be in the vineyard, the garden, the courtyard, the greenhouse or the Barrel Hall. The vineyard house is a three bedroom, four-and-a-half-bathroom home that can be enjoyed by the wedding party. The Barrel Hall is located 15-feet underground. Cellar-temperature, it is spacious and modern and where the winery hosts live concerts. 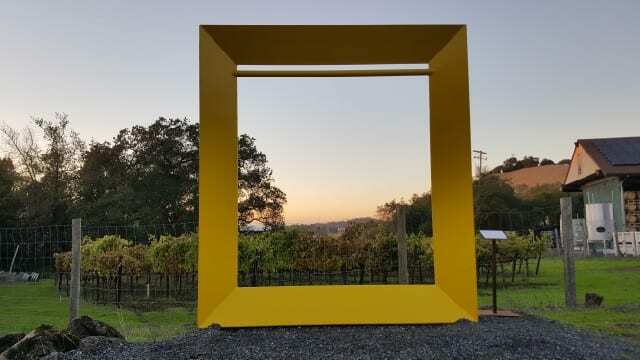 Folktale Winery is dog-friendly, offering dog bones at the entrance, and kid-friendly, with games, such as giant Jenga, a giant connect-four and corn hole, and serving all-natural juice made from Sangiovese. Located on the Central Coast, Paso Robles is located on the Salinas River north of San Luis Obispo. Halfway between Los Angeles and San Francisco, Paso Robles is home to more than 200 wineries and is a frequent weekend getaway destination. 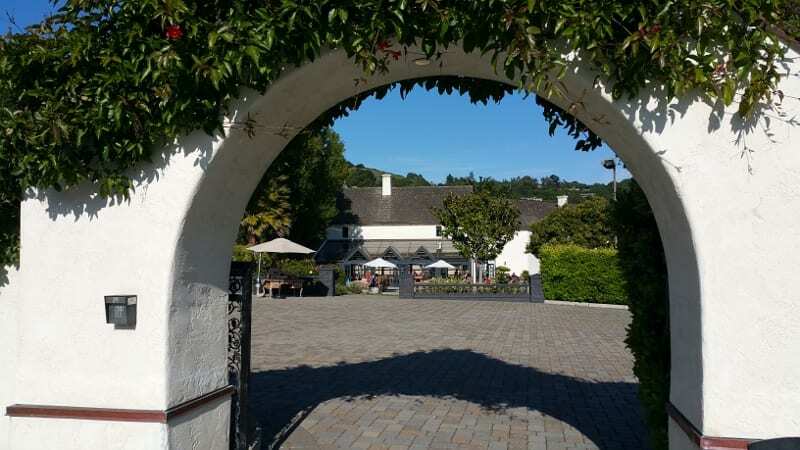 This is a great central spot for planning a California winery wedding. Located in the Paso Robles’ Westside Adelaida District, Halter Ranch dates back to 1881. In fact, the Victorian farmhouse on property was built in 1885 and renovated in 2000 by current owner Hansjörg Wyss. Sitting on 2000-acres, there are 281 acres planted to grapes, an airplane strip and wildlife corridors, which are areas only for wildlife. Halter Ranch combines elegant and rustic for a romantic wedding venue. For weddings ranging from 120-200 guests, Halter Ranch offers a selection of locations on property. The Ceremony Site is an outdoor area with landscaped walkways and gardens that can be used for a ceremony or the reception. The renovated Silo Barn, formerly the grain silo, offers a bucolic setting for a reception. The Silo Patio, an open-air space surrounded by the silos, is a perfect location for dinner and dancing under the stars. The Historic Old Bar, with capacity for 200, is a charming rustic space for larger ceremonies or dinner receptions. The Victorian Garden is an intimate area for a welcome reception. This entry was posted in Lifestyle, Travel and tagged California Winery Advisor, Deerfield Ranch Winery, Folktale Winery, Halter Ranch, Monterey, Paradise Ridge Winery, Paso Robles, Sonoma, weddings, wine country, winery weddings by Allison Levine.